China Wushu Sanda (Free Sparring), through practice of about twenty years, gets reception of fans. 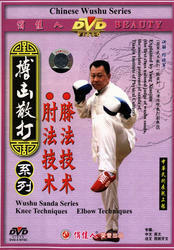 Its "kick far, hit near, wrestle body contact" embody the soul of China traditional Wushu. Yang Xiaojun was a famous sanda athlete, serve the associate professor of sanda of Tianjin Physical Culture Institute now, seventh degree dan of Chinese wushu, the first level national judge of wushu sanda. This teaching material of sanda introduces very detailed and systemic from theory to practice in the simple explanations to the profound techniques and skills, and it is an excellency of this series. Explained by Yang Xiaojun, the first-class national judge of wushu sanda, the associate professor of sasnda of Tianjin Institute of Physical Culture.